No, not cunning but creative--->I make stuff! 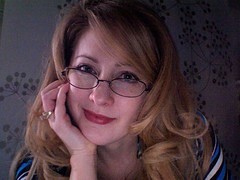 Lovely Lady Jen, aka Mrs. Zach Baker, has tagged me from her too-cute-for-words blog Pretty/Modest. Go there to see her handmade bag that is so much more than an homage to the window treatment transformation magic of either Scarlett O'Hara or Sister Maria... it's the essence of cute, sweet, sassy, and classy distilled into a faboo accessory. OK, on to my creation. I cannot claim the original design as my own. I took the idea from a magazine or a book (I can't remember which and can't find the project online right now) and followed the general idea of the design, interpreting it with my own flair. Most of the beads are glass. The feature bead, the pink quartz donut, was the inspiration. Everything else developed from there. Those clunky-looking silvery things are clip-on earrings (I do not have pierced ears) that have something of a small jump ring attached so that you can add danglies and then use pliers to bend the ring closed.